Weekend evenings spent at a small town’s plaza are still possible in Mexico, in spite of urbanization and population growth. Even in Mexico City, neighbourhoods such as Coyoacan and San Angel feature old-fashioned markets with a cornucopia of colourful and enigmatic offerings, including of course, a truck-full of street foods. In Morelia, the capital city of the state of Michoacan, one of the best known street foods is chicken with vegetables and red enchiladas. Nowadays, many restaurants also serve this delicious combination, and I just tried making my own homemade version recently, a sure way to dress-up a pair of basic red enchiladas! The only important element from the original dish that is missing in my photos, is shredded lettuce, which is traditionally placed as a bed on individual serving plates; trial and error has made me opt for a regular garden salad instead, served separately, to avoid getting the lettuce soggy under the hot food. In the meantime, I prepared the adobo sauce, as explained in detail in a previous post, by toasting the peppers (I used four guajillo and four ancho) and the second garlic clove in a dry skillet; setting the garlic clove aside, I blanched the peppers in boiling water for one minute and allowed to sit in the hot water for another 2-3 minutes. The drained and patted dry peppers should be flexible but not soggy; after I removed the stems and seeds, the peppers were placed in the blender jar with salt, and the reserved garlic and broth, processing until a soft paste was obtained. This adobo was further cooked by pouring in a pan with the vegetable oil and frying for a couple of minutes (photo, right). I thought my homemade version of this plaza style chicken still provided that nice feeling after enjoying a hearty Mexican meal, well balanced from placing protein and veggies on the plate, together with the basic red enchiladas. After such a wonderful dinner, a pleasant walk with the dog was good enough to replace the stroll around the gazebo at the plaza, even though here, in Southern Ontario, it was definitely chillier than in Morelia. I am joining What’s for Dinner? 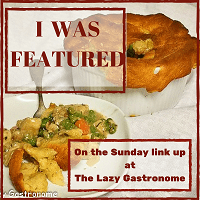 Sunday Link-Up #169 graciously hosted by Helen @ The Lazy Gastronome. Heavenly tasty & soulful. Keep sharing. I will soon visit your blog again. Stay connected with me. We are in same field. Such a pretty plate. I think I’ll get myself down to the plaza to have some myself..Actually, I was transported by your recipe and forgot I’m in the States for awhile. Oh well, when I get back to Mexico! That is funny, thank you for your comment, Judy! Tasty I’m sure, and looks very nice on the plate too. I like this vegetable/chicken dish plated up with the enchiladas. This is my kind of Mexican meal – you make your own adobo sauce! I’ll have to add this to my “make soon” pile of recipes. Thanks for sharing a little bit of Mexican cuisine with Fiesta Friday. Thank you so much for your comment, I hope you get to try this recipe! Yeah, I know, some of those cooks are true masters! However, I do not have Mexican food trucks in my area :(, and when I cook at home, I like the control I have over the amount of oil added, and that I am able to cater to my family’s preferences. Chicken is a staple food in my family and this chicken recipe of yours is so interesting because of your Adobo sauce.I will try this. I am smiling while making this comment because my current post is our national food ADOBO which I made pork and chicken together. Too bad, I was not able to take a new photo…all gone too soon.. Have a great week ahead. Hi, MarEliz, and thank you for your comment! I am going to go check your post right now; I love to see the different interpretations of a dish. Have a great week ahead as well! That is a beautiful, succulent looking dish. Thanks for sharing at the What’s for Dinner party! Have a wonderful week and hope to see you at next week’s party too! Thank you, Helen, have a wonderful week, too!